It was just as Jansenism was causing a "coldness" to enter into Catholic life in France, that the revelations to St Margaret Mary Alacoque, concerning devotion to the Sacred Heart of Jesus, were made. This was a devotion in which the heart symbolised Jesus' perfect love for mankind; it began to grow in importance in the eleventh and twelfth centuries and was later promoted by St Gertrude and St Bonaventure amongst others. St Gertrude (died 1302) is said to have had a vision of St John the Evangelist on his feast day, where he told her that devotion to the Sacred Heart of Jesus was reserved for subsequent ages, when the world would need to be reminded of his infinite love. This devotion was very much a private affair until about the sixteenth century when it came more into the mainstream of Christian practice, particularly under the influence of writers such as St Francis de Sales and prominent Jesuits such as St Francis Borgia and St Peter Canisius. It was still essentially a private devotion, though, until St John Eudes worked to establish a feast day, which was first celebrated in 1670. This feast of the Sacred Heart gradually spread to other dioceses in France and eventually coalesced with the devotion that began as a result of the apparitions of Jesus to St Margaret Mary, in the small town of Paray-le-Monial in central France. Earlier in the seventeenth century France had been consecrated to Mary by Louis XIII, an example followed by a number of other nations including Portugal. The first apparition took place on 27 December, the feast of Saint John the Evangelist, probably in 1673, while Margaret Mary was a nun in the Visitation convent at Paray-le-Monial. There is some uncertainty as to the precise dates of the apparitions, but not their content). She related what happened to Fr. Claude de la Colombiere, who was in charge of the Jesuit house in the town, describing how she had a vision of Jesus during which she was given some idea of the greatness of his love for mankind. 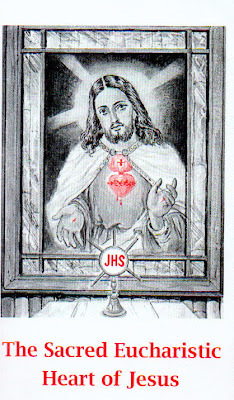 Jesus told her that he wanted her to tell the people of this love, and a similar theme was expressed during the second apparition, early in 1674, when Margaret Mary saw Jesus' Sacred Heart on a throne of flames, transparent as crystal, surrounded by a crown of thorns signifying the sins of mankind, with a cross above it. Again Jesus told her of his infinite love for mankind and his desire that he should be honoured through the display of this image of his heart, with the promise that all who did so would be specially blessed. The third apparition probably took place on 2 July 1674, while Margaret Mary was praying before the Blessed Sacrament exposed, that is the host consecrated during Mass which had become the Body of Christ. She saw a vision of Jesus in glory, with his five wounds shining like suns, and he then showed her his heart on fire with love for mankind, a love that unfortunately was often ignored or treated with contempt. He asked her to make up for this coldness and ingratitude by receiving Holy Communion as often as she was allowed, and particularly on the first Friday of each month. This idea of making reparation for the sins of others is also prominent in the messages given by Mary to the children at Fatima in 1917. To make up for this he asked that the first Friday after the feast of Corpus Christi (Latin for the "Body of Christ"), should be dedicated as a feast in honour of his Sacred Heart, when people should receive Holy Communion in reparation. The "Great promise" associated with this devotion applied to those who went to Communion on nine consecutive First Fridays: "I promise you, in the excess of the mercy of My Heart, that Its all-powerful love will grant to all those who shall receive Communion on the first Friday of nine consecutive months the grace of final repentance; they shall not die under My displeasure nor without receiving the Sacraments, My Divine Heart becoming their assured refuge at that last hour." These promises have been endorsed by successive Popes, and were explicitly mentioned in the bull of St Margaret Mary's canonisation authorised by Benedict XV. Obviously this last promise in particular is dependent on people adopting an interior attitude of love towards Jesus, and not abusing his goodness. This promise is paralleled by the one made to Lucia, that of the Five First Saturdays, following the apparitions at Fatima. This series of apparitions has been approved by the Church, which has vouched for their authenticity as far as is possible. The writings of Margaret Mary, which included these revelations and her letters, were examined during the process of her beatification, and she would not have been canonised, that is declared a saint, if they were not reliable. Likewise, the popes have expressed their approval of these apparitions, with their essential content being included in the bull of canonisation by Pope Benedict XV in 1920, while the feast of the Sacred Heart has been established in the Church calendar as requested.